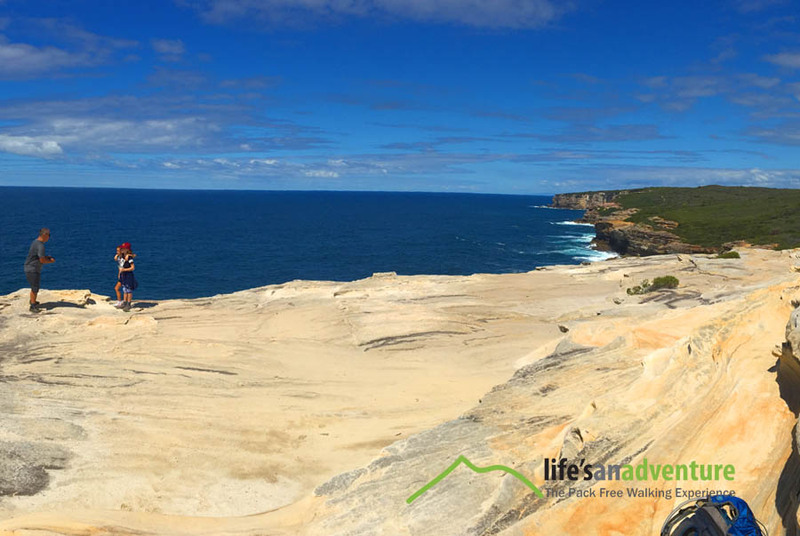 You would never guess such a magnificent hiking experience would exist in Sydney. 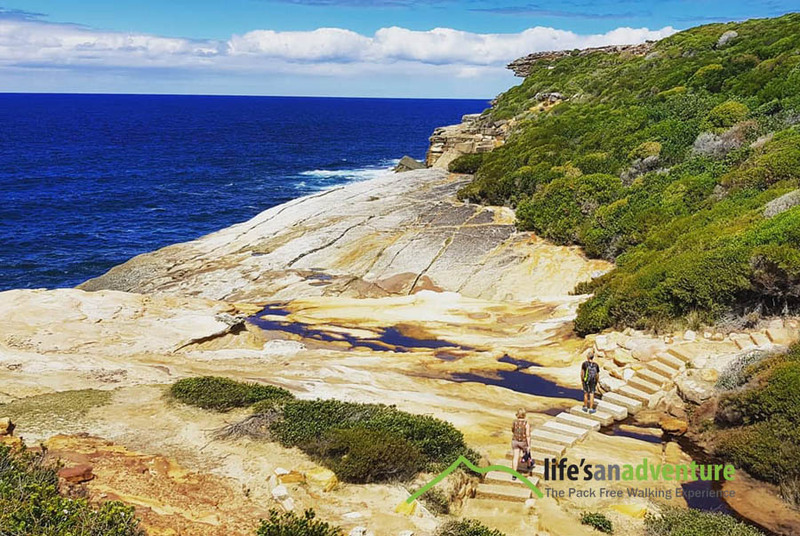 This award-winning 2 day Pack Free Royal National Park Walk on the spectacular Coast Track is the jewel in the crown of the Royal National Park in Sydney. 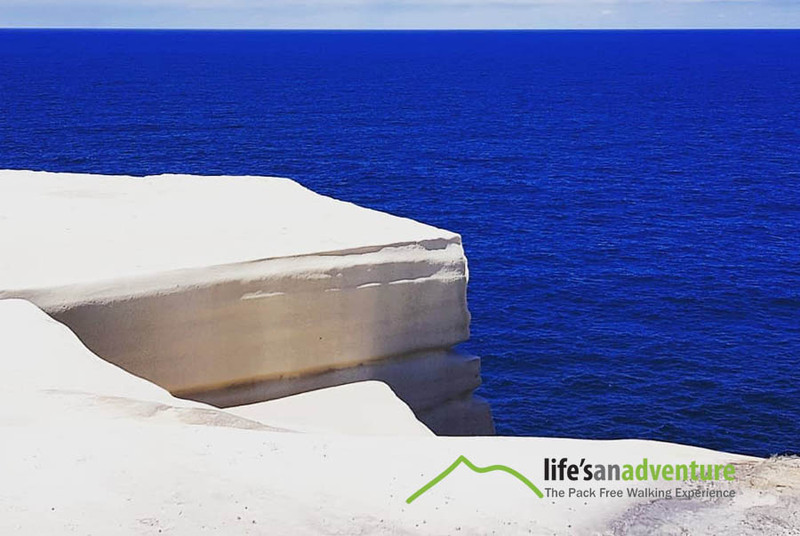 The Coast Track runs along sheer sandstone cliffs with panoramic views stretching miles in all directions. Experience picturesque freshwater lagoons, the unusual milky white cliff faces sculpted by the sea, ancient Aboriginal carvings and the tranquil Palm Jungle rainforest plus much more. 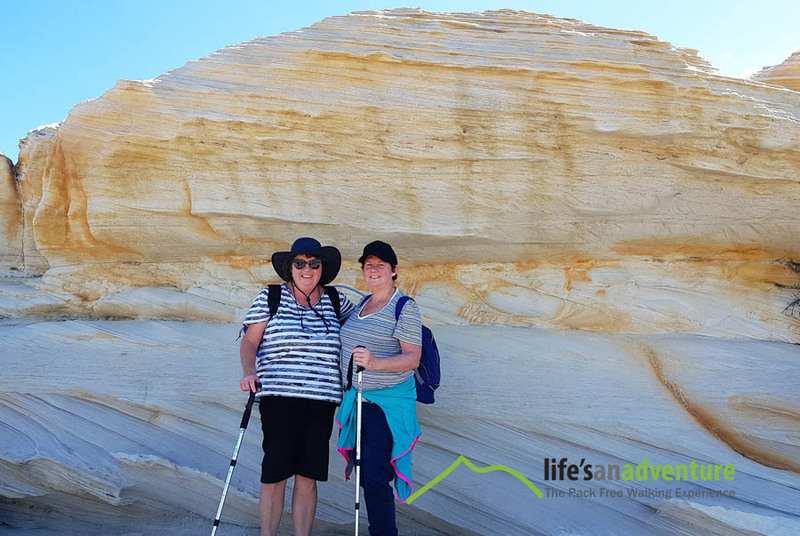 This is a 26km walk over 2 days with unlimited opportunities for photographing the scenic coastline, and observing birds and wildflowers in this magnificent National Park. This walk has been designed for those looking for a guided multi day walking experience with everything done for you, so you can focus on enjoying the walk. Our guests won’t be asked to carry their clothes or overnight bags for the entire tour, these will be transported for you each day. This is a big advantage for our guests, in that you will avoid carrying a heavy rucksack on your back every day. With Life’s An Adventure you will carry as little as your water bottle, camera and lunch each day! Spend one night at a Heritage Cottage in the National Park with modern decor. A fantastic place to enjoy a good night’s sleep and a hot shower after a day’s walk. If you have your own transport, we are happy to offer complimentary one night pre-tour accommodation at the Heritage cottage before your tour. Please request this when booking. Please note due to its remote location you will need to be able to drive to the cottage to stay the night prior. Our guides will pick you up fro the cottage on morning of day one. Our tours are designed to be personal and intimate with a maximum group size of 8 people. Where possible we source the majority of our foods from this region including fabulous wine and local produce. We are proud to have won a multitude of Tourism Awards including the Qantas Best Australian Adventure Tourism Business of the Year. In total we have won 21 Tourism Awards of Excellence including 6 NSW Tourism Awards of Excellence and 4 Greater Sydney Tourism Awards of Excellence. Professionally guided – Our guides are so passionate, knowledgable and enthusiastic, they will be having just as much fun as you. Australian Red and White Wine and non alcoholic drinks to enjoy with your evening meal. Please note we advise drinking in moderation as this is a strenuous walk. If you would like to enjoy any alcohol after dinner you will need to provide this yourself. For those driving: Meet at Otford and we will transfer you at no extra charge to the start of the walk. On day 2 when you arrive at Otford you can simply jump in your car and go. For those taking public transport: Meet us at the start of the walk at Bundeena and on day 2 we will drop you at a train station with regular services such as Sutherland at no extra cost for the journey home. (Though the Otford railway station is 2kms from the finish of the walk, trains only arrive every hour – so we don’t want you to have to wait around). Or for those visiting Sydney: We offer a hotel pick-up and drop off from the Sydney CBD for an additional $40 extra per person. PUBLIC TRANSPORT: For those catching public transport and then a short ferry ride to Bundeena Wharf. Once at the wharf its a 3 minute walk to Cafe Manna 2/22 Brighton St Bundeena, where your guide will collect you.Ferry departs Cronulla at 8.30am and arrives at Bundeena at 9am. DRIVING: For those driving meet us at Otford Lookout at 8.30am and we will transfer you to the start of the walk at Bundeena. STAYING PRE NIGHT AT COTTAGE – Our Guides will pick you up at the cottage on the morning of day one. 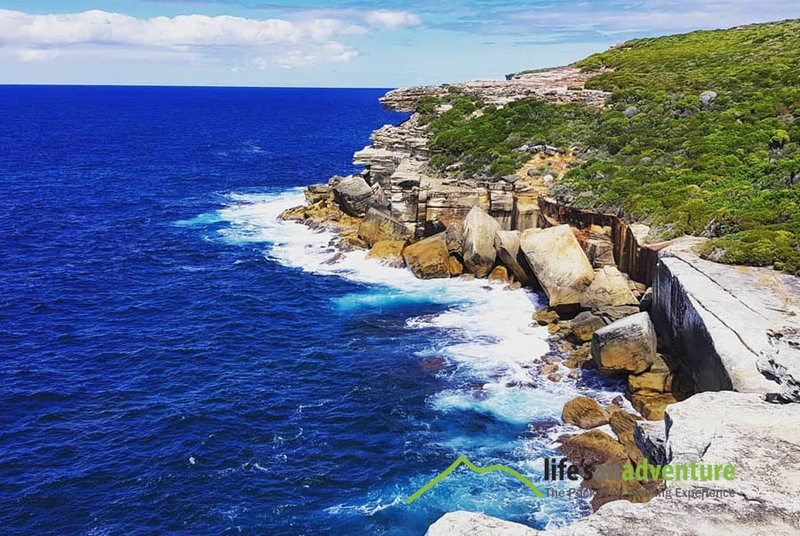 From Bundeena wharf we walk along the track through coastal heathland to Jibbons Head where you get your first look at the spectacular coastal views which make this walk so special. On a large flat expanse of sandstone the Aboriginal inhabitants of this area the Dharawal people engraved a number of subjects into the rock. Some are distinct, but you should be able to make out three large whales or sharks, a stingray, a jellyfish, a male figure with six fingers assumed to be a law- maker, a wallaby, a shield and a tortoise. (The sandstone is very sensitive to visitor’s walking boots. Please ensure to walk with great care while accessing this site). 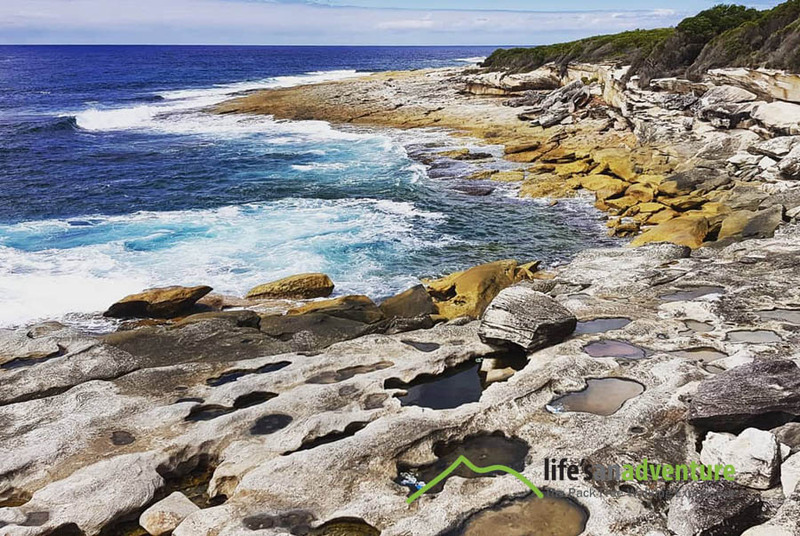 The relict cliff-top dunes we will explore between Jibbon and Marley Beach Formed during the sea level rise roughly 10,000 years ago and are the most extensive and best preserved examples in New South Wales. The rock platform drops down from Marley Head to the wild but beautiful Marley Beach. There is few untouched and totally natural beaches left in Sydney, but Marley Beach is one of them. A large freshwater lagoon behind the dunes teems with bird life and is a favourite haunt of deer. The track continues along the shoreline to just above the rocks to the pleasant cove of Little Marley. Little Marley is an arc of yellow sand backed by grassy flats dominated by she-oaks. From here the track runs close to the cliff edge where great blocks of sandstone have fallen from the cliff face and constant weathering has opened up long, deep cracks in the flat rock. 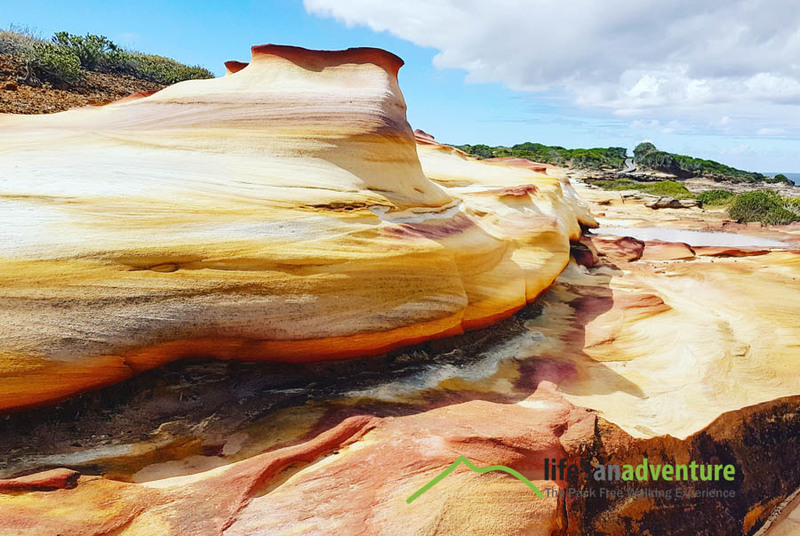 The beauitful colours and patterns in the bare sandstone are caused by iron and other minerals seeping into the white quartz sand. The views from here are stunning. We arrive at beautiful Wattamolla, one of the most popular beaches in the park. Sand across the picturesque inlet at Wattamolla forms a small beach trapping the waters of Wattamolla Creek to form a large lagoon. Known after its aboriginal title, Watta-Mowlee meaning “place near running water”, referring to the waterfall that runs into the lagoon, the name was first recorded by the explorer Mathew Flinders who stopped here on the evening of 29 March 1796 looking for shelter. Time available for a swim before the short transfer to our acommodation. This heritage cottage is set amongst the bushland in the National Park with indoor and outdoor dining, comfy beds and hot showers. Tonight sit back and relax as our guides prepare a wonderful dinner served with wine. Walk: Approximately 15.5kms. Easier Option 10kms. After breakfast we transfer the short distance back to the track. We then walk to Curracurrang, there is a rock shelter where evidence has been found of Aboriginal occupation dating back 7500 years. We cross the Curra moors which are beautiful in springtime with wildflowers and honeyeaters. The Royal’s heathlands contain over 500 species of flowering plants. From July to November, many of these wildflowers are in full bloom, and you can walk amidst a riot of colour of hakea and kunzea. 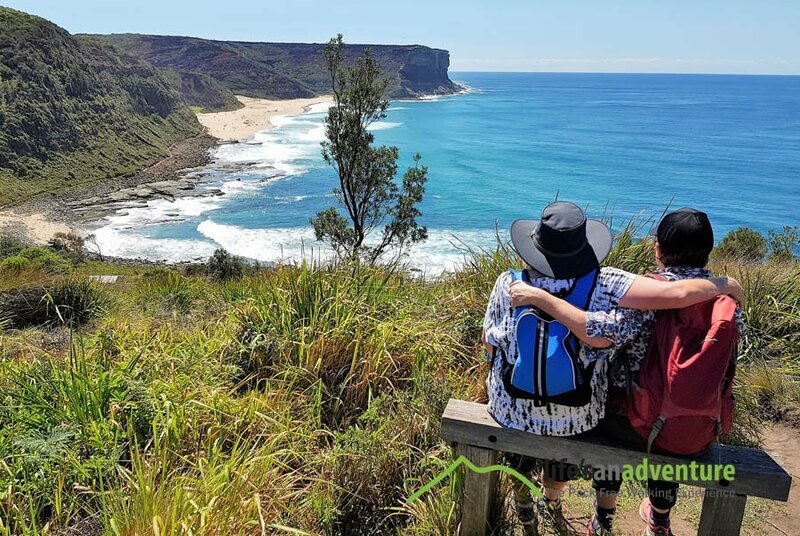 We continue to Curracurrong where two creeks drop as waterfalls directly into the ocean and spectacular Eagle Rock juts from the cliffs a massive block of sandstone with a tip shaped like the beak of an eagle. 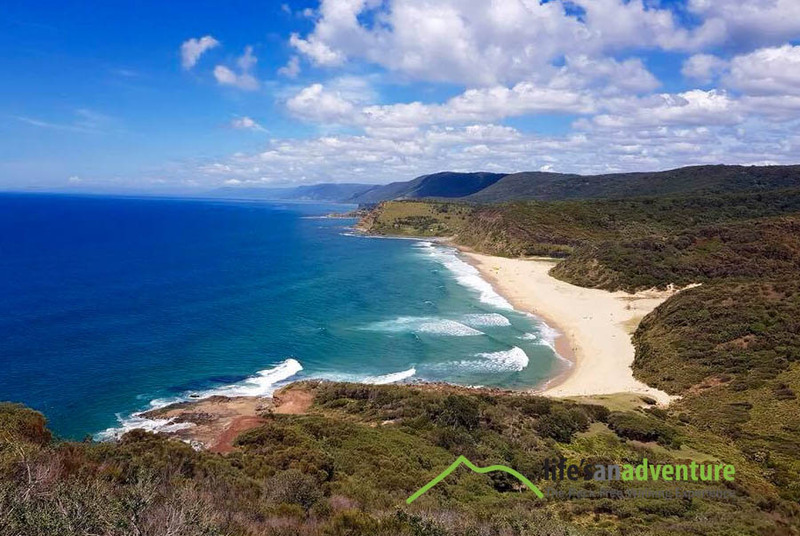 We continue through the Curra Moors until reaching the Garie North Head where the views are one of the finest in the park with vistas south to Port Kembla. Large aboriginal midden can be seen from this site near the beach where harvested shells, bones, and tools have been discarded. We pass the historic shacks of South Era, classified by the National Trust as a historic community. The cabins were built and used during the early 1920s through to the depression years of the 1930s. Out of work men supported their families catching fish, rabbits and growing vegetables. Along the way enjoy a delicious lunch. We head down to Burning Palms, the lovely beach is backed by Cabbage Tree Palms, lilly pillys and other rainforest plants. We cross open grassland before entering the rainforest. Enroute to Palm Jungle we travel through an exposed hillside of lomandra. Both the fleshy white base and the flowers of lomandra were food sources for the local Dharawal people. The Palm Jungle is a rare patch of coastal rainforest dominated by Cabbage Tree Palms. The canopy is closed and the track is cool and shaded. Moss and ferns cover the ground and rocks. Bangalay eucalypts emerge from the canopy and large figs are scattered along the steep slopes. We continue to Otford where your journey ends. For those who didn’t drive and are catching public transport we are happy to drop you at Otford Railway Station or a Station enroute back to Sydney. Or if you have chosen Sydney transfers we will take you back to the Sydney CBD. Easier Option: For those wanting an easier option on day 2, our second guide will meet along the track, just after South Era and walk you out to our waiting vehicle. Easier walk is 10kms. Meals & Guides Excellent. Daniel's knowledge of native flora and fauna was fantastic. I loved that we were able to taste indigenous foods along the way, that he pointed out objects, and told interesting stories that were attributed to the aboriginals that lived in the area. Camping - Excellent. Overall impression of the tour. Beyond Expectations. I had a great time. Good food, good company with fantastic scenery and landscapes. Overall an awesome walk that I'd do again if the opportunity arose. Meals - Excellent. All the food was fresh and tasty! Guides - Excellent. Amy, Adam & Daniel were professional and knowledgable. They worked tirelessly to ensure that everyone had a great time. Camping - Excellent. Comfy mattresses! Overall impression of the tour - Beyond Expectations. Thanks for providing the whale acrobatic show. After a great day hiking, it’s nice to have a fantastic place to come back to. We spend 1 night in a heritage cottage set amongst the bushland in the National Park with a short stroll to the picturesque river with its stunning turquoise water. With indoor and outdoor dining area, a large lounge area to relax as well as one bathroom with hot shower and comfy beds, this is the perfect place to kick back and relax as our guides prepare a delicious meal for your enjoyment served with Australian wine. Note: for larger private groups we offer alternative accommodation. Accommodation may vary subject to availability but will be replaced by a property of equal standard. This tour runs once a month from September to May. To check real time availability check the section below. Private groups of 6-8 or can save an additional $50 per person (on above savings) when they book a departure. Choose a date of your choice - subject to availability. Book and pay in full at time of booking to receive these special offers. Book and pay in full at time of booking. Departure of your choice. Available for groups of 6-8 people. Exclusive departure dates can be organised for groups of 8 or more. Please enquire for dates and pricing. Early bird or Red Hot Special discounts cannot be used in conjunction with another offer. To receive these special discounts, full payment must be made at time of initial booking. There a tour is altered due to unsuitable weather conditions, our guides will provide the best alternative itinerary possible, no refunds are provided for cancelled activities on tour.